Today, we celebrate Dads of all shapes and sizes, in all walks of life, with all kinds of kids. It’s a tough job being a (good) parent, one that our kids won’t truly appreciate until they walk in our shoes. Special shout outs today to the guys in my life whose responsibilities as fathers have recently taken on new meaning . . . To nephew, Geo, who, having just married his fiancée, Reneé, is celebrating his first Father’s Day as an official stepfather. To our cousin, Nick, who is celebrating his first Father’s Day as Dad to two children. He, his wife, Katharine, and their daughter, Hayden, welcomed baby Harrison to the family a little more than a month ago. And to our friend, Mark, whose only child – his daughter, Katy - just recently became engaged. He’ll be stepping into “father-in-law shoes” when Katy and her fiancé, Andrew, tie the knot. Love and best wishes to all these guys! As for our own special guy, I have no doubt that Alan will be a “Happy Father” today – not only will he be spending the day boating (his passion), but he’ll be able to do that with the two reasons he’s a Happy Father (son, Ryan, and daughter, Kyra), plus a bonus kid – Ryan’s longtime girlfriend, Anya. You’re the best, Alan! Enjoy your day! Here’s hoping that all of you who are Dads (in any variation of the word) have the opportunity to spend the day exactly as you wish and that it turns out to be relaxing, enjoyable and happily memorable! Now, as for these people at Mike’s Hard Lemonade . . .
A couple of weeks ago, I was on my way to meet Ryan at Gander Outdoors to shop for a birthday gift for him when a very bright, very yellow camping rig caught my eye. It was about a quarter of a mile ahead of me, but I couldn’t see it clearly due to the amount of traffic in town. As it so happened, the traffic between us cleared and I ended up directly behind it at a traffic light. 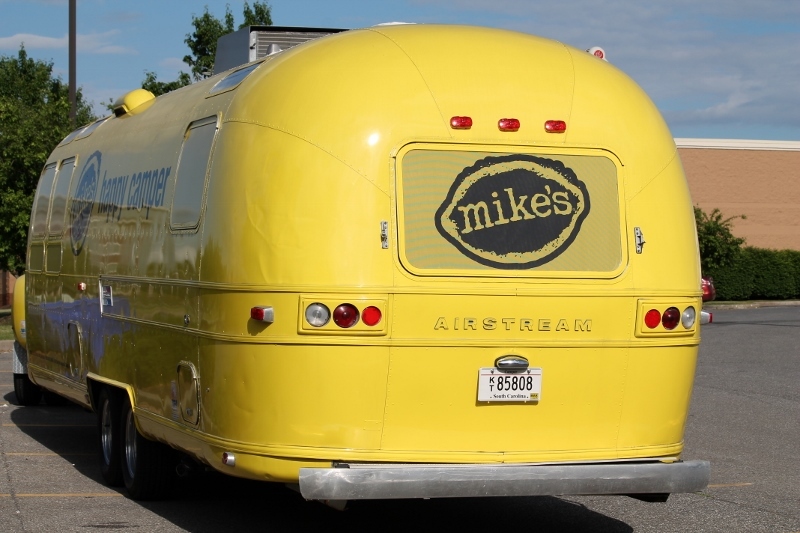 It was an Airstream, with a spectacular paint job and “Mike’s Hard Lemonade” graphics on the side. Apparently, it’s known as the “Happy Camper” and the tow vehicle was a Chevy Silverado painted to match. Quite eye-catching, actually. If Ryan had not been waiting for me at Gander, I would have followed the rig just for the chance to take a few photos and talk to the driver. But, being the responsible person I am, I continued on to meet my son. (I hope he appreciates my integrity.) With our shopping at Gander concluded, we headed our separate ways and I went back to where I had seen the Happy Camper turn into a local shopping mall. After a little bit of reconnaissance, I did locate the rig – it was parked next to a hotel with no driver in sight. I considered myself lucky to have found it although, I have to admit, I would have loved to see the interior of that Airstream. 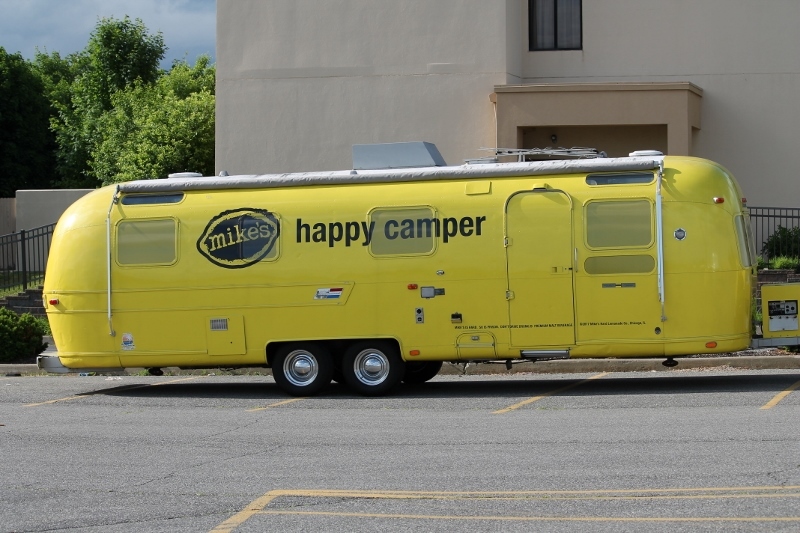 I snapped some pics and decided I’d check the Mike’s web site for some background info on the Happy Camper. That’s when things got interesting. 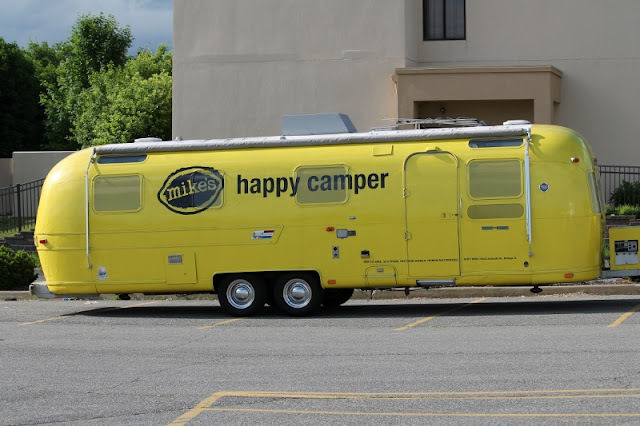 I found absolutely no mention of the Happy Camper on the Mike’s Hard Lemonade web site (link HERE) – no description, no schedule, no advertising. (Conversely, Oscar Meyer maintains an entire web page for the Wienermobile.) 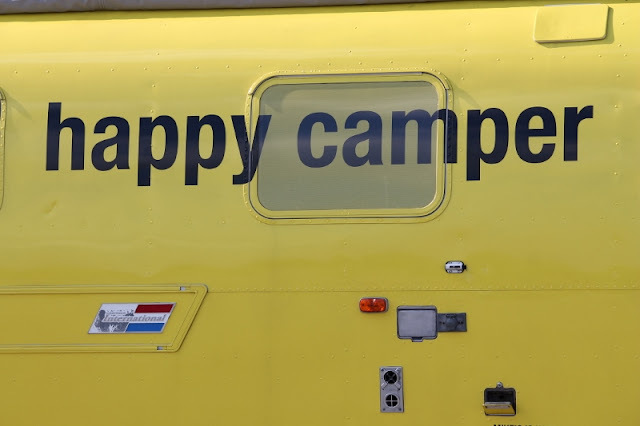 I plugged a few different phrases into a search engine, but the only thing I could come up with was a Facebook page for a winery that documented the appearance of the Happy Camper at one of their events. I should have bookmarked it when I found it because now I can’t even find that again! At least I got to see what the inside looked like – the interior design was exceptional, but I don’t even have that link to share with you. Sigh. My degree is in Business Administration, not Marketing, but even I can’t understand why a company would go through the effort and expense of a major marketing campaign like this and then NOT publicize it! 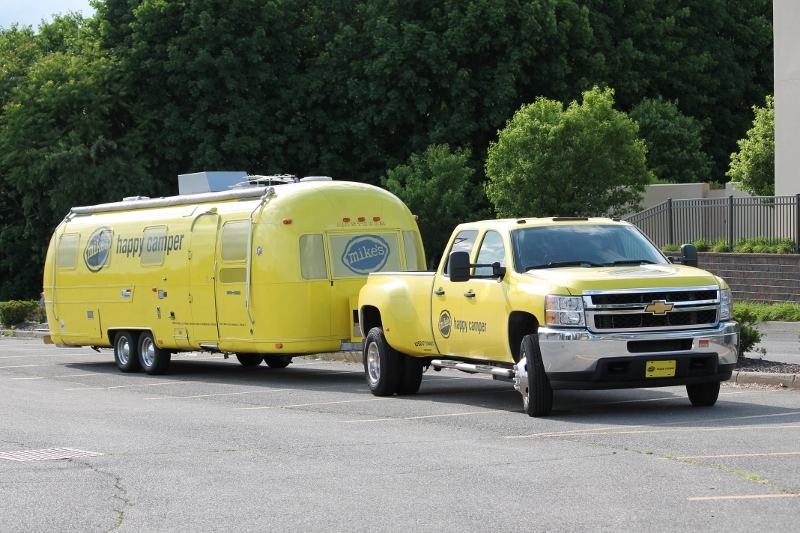 We all know that those Airstreams aren’t cheap, plus there’s that Chevy dually and a driver . . . But wait, there’s more. Since I’m nothing if not obsessive about details, I used the “Contact Us” form on the Mike’s Hard Lemonade web site to request some information about the Happy Camper. I explained that I wrote a blog about RVing and I wanted to do a post on their traveling trailer. I asked for some basic information on the rig plus a schedule of appearances – anything and everything they’d be willing to share. Well, apparently, they’re not willing to share anything since I received no response from Mike’s. N-O-T-H-I-N-G at A-L-L. This boggles my mind. I can’t even imagine a company not wanting to publicize something like this. Personally, I think I’d be recruiting a new marketing team. 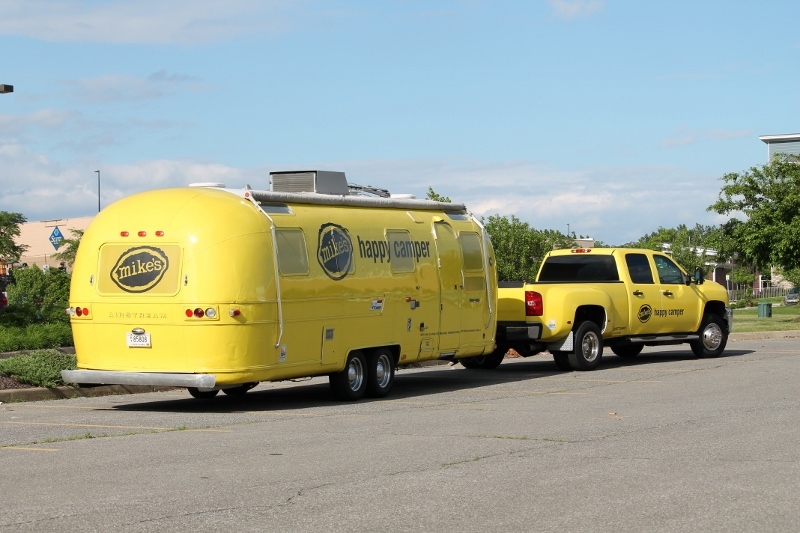 If you happen to know anything about the Happy Camper, please do share it in the Comments section below. I thought it was a unique use for the Airstream and figured that, if I found it intriguing, other RVers might, also. At the very least, my photos are proof that it wasn’t a figment of my imagination! Thanks for your greats posts. I enjoy reading them very much. 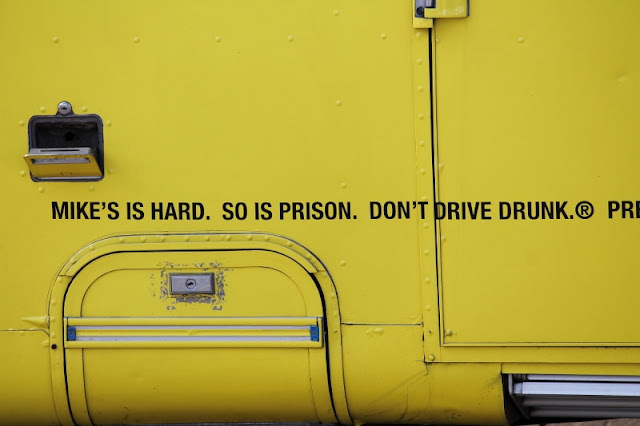 To complement the campaign launch, Mike’s Hard Lemonade is embarking on a “Happy Camper” mobile sampling tour for which a custom-wrapped, bright yellow trailer will stop in select markets. 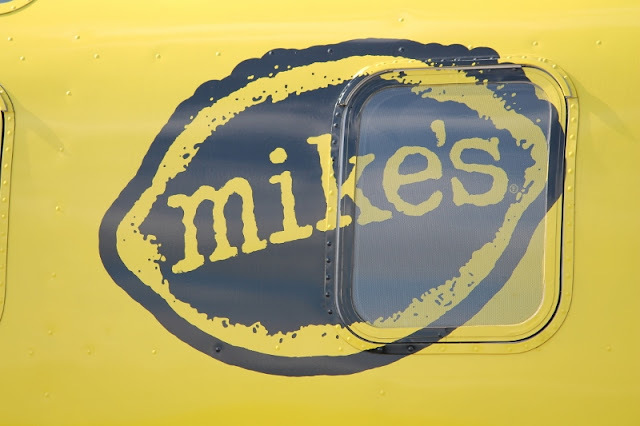 Those dropping by the trailer can try Mike’s flavors and take part in special brand experiences. Additionally, Havas Formula will amplify the campaign with a PR program through press, influencer and consumer engagements. Thanks for your kind comments, Toni - they're very much appreciated! Definitely words of encouragement to writers like me. Thanks, too, for providing the PR link for Mike's. I missed that one, but did see a similar one from around the same time frame - spring of last year. I couldn't find anything more recent though. I just don't get it! Have a terrific day, Toni, and thanks for stopping by! I Can't Go Camping, So . . .